Mechanics, ag professionals, and equipment operators regard this product as “FIRST AID” for its reputation to safely, quickly and effectively overcome the common petroleum residue and moisture problems that impair Hydraulics, Automatic Transmission, and Power Steering fluid systems. 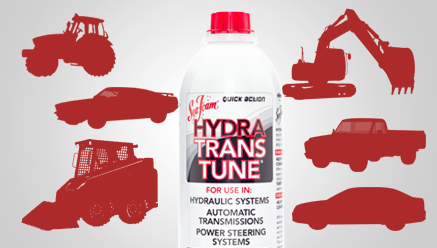 TRANS TUNE is the new product name and packaging label for HYDRA TRANS TUNE. Same petroleum ingredients, identical product application and part number as HYDRA TRANS TUNE (TT-16) . 2. For use in HYDRAULIC FLUID SYSTEMS. TRANS TUNE is an excellent hydraulic fluid system cleaner and conditioner that works safely and quickly to clean sticky pressure valves, solubilize moisture, and dissolve varnish formations in hydraulic fluid. Can add any time as a pre-flush cleaner or to help keep systems clean over the life of the hydraulic fluid. 3. For use in AUTOMATIC TRANSMISSIONS. TRANS TUNE works safely and quickly to smooth out automatic transmission shifting problems caused by petroleum varnish formations and deposits. Can be used as a pre-flush cleaning treatment or as a preventative conditioner for the life of the transmission fluid. Can be added to transmission fluid at any time! 5. For use in POWER STEERING FLUID as a CONDITIONER. TRANS TUNE works to overcome hard steering and noisy steering pumps caused by varnish deposits in pumps, gears and pressure valves. Add 4 to 6 ounces of HYDRA TRANS TUNE to steering fluid reservoir to clean and condition system parts for the life of the fluid. Can be added to fluid reservoir at any time! 7. TRANS TUNE only contains petroleum-based ingredients and will not alter the viscosity of petroleum fluids, will not swell seals or harm gaskets, O-rings, or clutch material. Sea Foam products DO NOT contain harsh detergent or abrasive chemicals that can harm engine fluid systems or components.